In 1993, I fell behind in my rent and was evicted. I had a job, but for the next 4 months I lived in my car while I saved up enough money for a months bond and a months rent on another place. I would park in a car park near my old place for the night, and in the mornings, drive to a caravan park near by, sneak in, have a shower and go to work. Since then, I have made a good living for years as a Chef, and Entrepreneur, for the most part living selfishly and not giving a second thought to those sleeping rough. In May 2015, I was walking along Carlisle street in St. Kilda East, Melbourne, to my local Coles supermarket. As I approached the brand new Bank of Melbourne I see a bright, white doona crumpled up in the tiny alcove of an unused doorway. As I got closer I noticed there was a man curled up in the doona, on the hard concrete floor, trying to get some sleep… at lunch time. So many people were walking past, looking, but moving on with their day, as I have probably done since 1993. This time I couldn’t walk past, I stopped and asked him if he was ok… he said “yeah mate, thanks, just trying to get some sleep”. He looked so tired. I said, “here mate” and gave him the $20 I had in my pocket. His eyes lit up, he smiled and was so grateful. He shook my hand, thanked me again with a smile and curled back up under the doona. When I got home, I told my family what had happened and tears rolled down my face. That man, trying to sleep on a concrete floor, in the middle of the day, on a busy city street affected me in a profound way. And that’s a mild story; for many sleeping on the streets are being subjected to terrible weather, harassment, bullying, being robbed and worse. No one should have to live like that. Charity. For me, charity is practical. It's the ability to use one's position of influence, relative wealth and power to affect lives for the better. The dictionary defines charity as simply the act of giving voluntarily to those in need. Using my 20+ years of business experience, I set about developing a simple solution with a mission; to provide people sleeping “rough”, a safe overnight place to sleep. The more I developed and researched a solution, the more I discovered what a good nights sleep can do for a persons physical and mental health. Just being able to sleep through the night, warm and safe can give a person a whole new outlook on life. 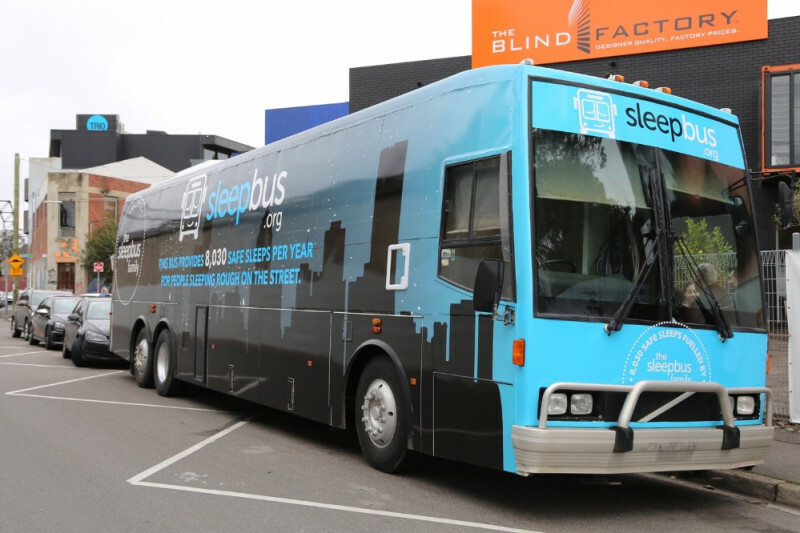 Sleep Bus is distinct, yet complementary, to existing efforts from other organisations supporting Australians experiencing or at risk of ending up on the streets. Our work aims to fill a ‘gap’, rather than overlapping or replicating activities that support the urgent needs of people in Australia. The least we can do is provide safe overnight accommodation to people sleeping rough in Australia, until they get back on their feet. We need to talk. It’s been 10 months since the idea of sleepbus was born and on the surface it looks like not much has happened, but the reality of setting up a Charity properly and for the long term takes time and more red-tape than I care to mention. That’s said, they are important steps and given our 100% model where all public donations go to sleepbus projects, it was important to make sure we did everything right from the start. So what’s been happening. Well let me take you through the list. Bus Design: Completed and is ready to go. The bus design includes 22 individual sleep pods, 2 toilets, 22 personal items lockers, under bus storage, 8 pet kennels, security system, lighting system inside & out and intercom system for family sleep pods with parental control locks. The toilet’s have been strategically located at the front of the bus to assist with the safety of guests within the bus. Sleep Pods: Each sleep pods comes with single bed inner spring mattress, pillows, sheets and blankets (washed daily). The pod has USB charging for mobile phones, personal light, lockable roller door, climate control and Television with auxiliary channel running adverts for available services in the area to help with pathways out of homelessness. Each pod can be adapted for families, with parents able to control their child’s door lock and intercom for communication between designated family members only. Various sizes have been tested. I’ve slept in a pod every night for 3 weeks or so and found it very comfortable and cosy, which is important. Even the kids had a go. sleepbus Brand: A complete brand has been developed including, various logos, our vision, mission and essence, all developed and documented. Our Vison: To end the need for people sleeping rough in Australia. Our Mission: To provide safe overnight accommodation for people sleeping rough in Australia. Our Mantra: sleep changes everything. charity constitution completed and register, Charity status lodged and awaiting our Deductable Gift Recipient status which takes several months. Two separate bank accounts have been setup to manage our 100% Model; one account is for public donations; this money will all go to sleepbus projects; the second account is for corporate donations to assist with the costs of running sleepbus. Money can be transferred from the corporate account to the public donations account to assist with projects, but can never be transferred from the public account to the corporate account. This is even written into our constitution. Website: Thanks to a very generous donation from Zeemo.com.au , we have a basic website up and running while the Zeemo team build our larger and more robust site for the future. Zeemo has also completed all the final logo designs and other branding, all of this is very time consuming and expensive work, but they were the first corporate to join the sleepbus family and do everything for free. Amazing. Volunteers: sleepbus has been inundated with offers of support; Zeemo as mentioned, all the legal work has been donated, a company has offered to clean all our buses for free once we’re up and going and Belinda Jane Video.com has offered their assistance to video the story of sleepbus from idea to birth and more. This will help you, our family, see everything that goes into building sleepbus, getting people off the street and provide safe sleeps. We have had many many other offers of help from individuals via our Facebook page . I can’t express how amazing it feels to not only have people love and support an idea, but to also know, we’re not on our own, there is plenty of help at our disposal. So where are we now and what’s next. We have all the legal & Charity paperwork/red-tape done. The bank accounts and tracking system is done. Website stage one is up and the big bad boy of a site is underway and will be ready for launch this Winter. We have plans, designs, costings and material list done. We have operational guidelines, checklists and manuals done. We have our eye on several buses. So all that is ready, and now sleepbus is ready to ask for donations to build the first of many buses and get people off the street. We want at least one bus on the road by this coming Winter. That one bus will provide 8,030 safe sleeps per year and can last up to 10 years before it needs major work or replacement. One bus costs approximately $50,000 to buy and build. We have had significant interest from corporate organisations, but until now, two things have held us back, one; we weren’t prepared to do any deals or accept any money from anyone, until we were registered and everything was in order / two; corporates need to see proof of concept. What does that mean? They want to see the first bus up and running before they commit. And fair enough. Talk is cheap. And I am expecting significant investment from our future corporate partners. After all, we have a goal for 300+ buses to build and operate across the country, we’ll need there help in a big way to reach our goals and provide enough safe sleeps across Australia. But for now, its up to us, the sleepbus family. I really need your help. Winter is fast approaching, and we must have a bus built and ready to go by then. We need to stop doing paperwork now and begin the important work of getting people off the street and provide safe sleeps. One bus will provide 8,030 safe sleeps per year…just one bus. Share the sleepbus story & concept with everyone and anyone you know. Introduce us to corporates that are interested in what we’re doing. Start a campaign, at work or at home and raise funds for the first bus. Donate your professional skills to the sleepbus cause; we need an accounting firm to complete our books and auditing requirements; we need ongoing legal support; we need material suppliers; we need a bus supplier; we need trades; electrical, plumbing, carpentry, welding/metal work, auto electrical, mechanic, sign writer, auto spray painting. Introductions within local council addressing homelessness right now. Above all else, we need to get a bus. So sleepbus Family, if you were ever going to get involved now is the time. We have set ourselves a launch date. We have media wanting to run our story. Its time. If you believe in what we’re doing; if you want to do something about people sleeping on the street this winter; if you want to be a part of sleepbus history as a founding donor of the very first bus that starts it all. Every bit will help. Every cent will go to buying, building & operating the first bus. 100% Model. You will be able to find your name on the first bus, plus your name and generous donation will be forever immortalised in sleepbus history and we look forward to meeting you all at our sleepbus launch. Come on sleepbus family, lets make this happen. 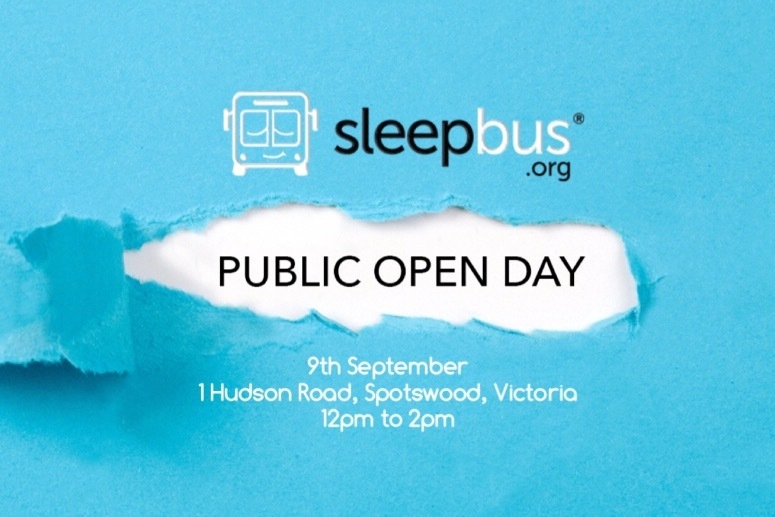 We would like to invite you to a Public Open day to tour sleepbus One, our new warehouse and to hear from our founder about The Pink sleepbus project and phase two of our strategic plan. This will be a very low key affair, no bells and whistles; just an old warehouse, an awesome sleepbus and a chance for our founder to speak and meet with those that have supported him and the sleepbus initiative. There will be a coffee truck available to purchase drinks and a sausage sizzle for you to get something to eat. There will be a small $5 entry fee on the day to help cover costs. Entry from 12pm and our founder will speak at 1pm. Let us know on our facebook events page who can make it so we can cater accordingly. * Please note that the warehouse doesn’t have toilet facilities at the moment; closest facilities are at the Spotswood train station, 5min walk away. Furthermore, our warehouse is 1min walk from Science Works, so bring the kids and make a day of it. Hi sleepbus Family, we have some exciting news. 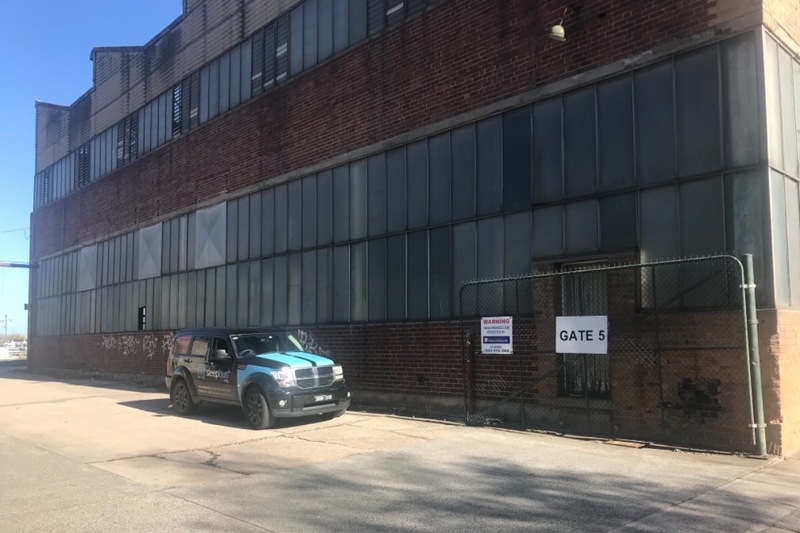 Long story short, we now have a warehouse and can begin building more sleepbus. A generous donor has given us the use of a large warehouse in Melbourne for free. Amazing. Now that we have a home base to work from, we can begin phase two of the sleepbus strategic plan. We have launched a new gofundme campaign called the Pink Bus Project. Please take a moment to take an look. Thank you for all the support, could not have done any of this without you. Fabulous idea. Simon, can you please get PayPal involved so I can donate, without entering my Credit Card details. Fabulous idea - would love to donate, but PLEASE allow sleepers to take their pets (at least dogs). Many street sleepers are denied shelter places as they can't take their dogs with them. It's a knee-jerk reaction to say 'no dogs'. It CAN be done - please allow it, and I will happily become a supporter. Hi Jo Webb, Sleepbus has pets already taken care of. Each bus comes with 8 kennels underneath for pets to enjoy a safe nights sleep also. Our friends at Pets for The Homless Australia will make sure they are fed and taken care of too. One thing I found while researching the sleepbus concept were the restrictions, we have one; if you can hop on the bus and allow all other guests to enjoy a safe nights sleep with quiet enjoyment. You're in. You can find more information about sleepbus features in our Facebook page or via the Pro Bono Australia article link on this page. This is such an amazing, inspiring story. Talk about innovation, Malcolm Turnbull: this is it, putting an enormous amount of hard work and ingenuity into a solution for homeless people. I hope this brilliant solution spreads nationwide and becomes a model for other countries as well. I"ve donated; hope you and your friends will consider contributing too. I"ve wanted to help homeless people for a long time, and this is the best solution I've seen. This is amazing, reading this made me have tears in my eyes. We need these sleep buses all over and in the UK for our English people. My mum was homeless when i was a child and i felt so helpless, not being able to help in anyway at all. I really hope this is successful and everyone continues to donate as i know how important this is to provide that safe place and warmth for the homless people. I wish there was something like this when I was a street kid, sleeping in tunnels, in clothing bins, under stairs in apartment blocks, even in the doorway of a kindy on their welcome mat, among other places. I'm so glad that our homeless have somebody like you and all those that are involved, a good night sleep to them is something they'll be forever grateful for. Now you just need a food van/coffee van in tow so they can have a sausage sizzle and drink before retiring for the night. If we had bus or buses parked at all the airports so that flight ticket holders that need sleep could also use a sleepbus. Whilst paying a small fee for doing so, it would be great to help& pay for those who can't. I get so tired being woken up and moved on when waiting a few hours for a plane thats not worth going to find a motel miles away for even less hours sleep when travel is delayed. Sleep is a health basic, very hard to find whilst working& travelling as a single Mum trying to save every penny.I've been asking for 'Pods' at airports for ages but this is an even better plan....Well done Simon.Come and do it in New Zealand too please. Absolutely amazing idea. I'll chip in when you expand to the UK! So is the bus moving all night, picking up people as you go, or does it stop once it's full. Where does it stop if that's the case? Just wondering. Looks like a great project! wow this is awesome! I don’t have any money to give for I am in a position where a sleep bus will really help me out. However I can pray of you for not only for you to meet you goal but past it. I wood be nice to have more than one bus’s. it also be grateful to have something like this go all though the country. it would be awesome if homelessness just end. I don’t get it, it’s like a spirit that just don’t want to leave... Anyways I declare a overflow in Jesus name! Hi Simon, would like to know if the bus has ever been operational? G'day Simon I just shared on my Facebook page but I was hoping the video of you showing off the interior of the bus, would also be shared because it gives a valuable insight to Sleepbus apart from me just explaining it to my Facebook friends and encouraging them to donate , so, Is there some way I can upload that video from my email on to my Facebook page to post ? Great idea. I have been thinking about doing the same thing here in the USA. I have been homeless and it is really hard. But having sleep and getting plenty rest help your mental health. Plus, having a shower helps with food. I have lived in my vehicle when I was homeless. I would like to know more about what you are doing. God bless! The article about Simon Rowe in the Sydney Morning Herald today is so inspirational. It also acknowledged the power of "gofundme" and the corporate donors. Thank you Simon Rowe. This is a fantastic project... I have passed out clean (used) doonas to the homeless in the past, leading up to winter.. I certainly would help with a donation if PayPal was involved... Well done on such innovation Simon..
Well done, Simon.....This is such a terrific initiative! One of the best initiatives I've seen to help the homeless. I donate because I think this is a great idea.